While getting into the Christmas spirit, we here at Prana put our heads together to come up with a few Christmas gift ideas to help spread healthy holiday cheer to yourself and loved ones. First, have you ever considered a standing desk for the office warrior in your life? The evidence about health concerns with prolonged sitting continues to mount, yet the general public is not convinced they need to make a change. Maybe others will want to follow the White House’s lead after they reported earlier this year to transition to standing desks. If the White House does not persuade you, perhaps this article and graphic describing the potential dangers of prolonged sitting will further encourage you to consider a standing desk. Second, for the athlete in your family, a foam roller. Foam rollers are a great recovery tool to help alleviate tension in tight muscles. Science is also beginning to support our long believed opinions that foam rollers can make a great recovery tool after exercise. Though the sample size is small, a recent study found foam rolling to be a useful tool in assisting in reducing muscle soreness pain and improving range of motion. Third, while on the topic of muscle soreness, have you considered tart cherry juice. In recent years, tart cherry juice concentrate is becoming more well known for its benefits as a sleep aid and alleviated muscle and joint pain. Even the arthritis foundation is beginning to promote the benefits of tart cherries. The benefits may also reach beyond arthritic pain, several studies show decreased pain in endurance athletes who drink tart cherry juice as a supplement. Most dark colored fruits, such as tart cherries, have high levels of antioxidants which purportedly help to reduce muscle tension. Furthermore, tart cherries are a natural source of melatonin which can aid with sleeping. For the runner: Anatomy for Runners – Jay Dicharry is the author as well as a practicing Physical Therapist who operates a running performance lab in Oregon. His scientific and entertaining look at running helps to manage injuries and improve performance. For the crossfit athlete: Becoming a Supple Leopard – Kelley Starret offers many unique, functional ways to assist you in gaining strength and mobility throughout your body. For the dancer: The Perfect Pointe Book – Lisa Howell is a renowned physiotherapist from Australia who specializes in treating dancers. In addition to her book, she maintains a blog The Ballet Blog which offers helpful advice and news about developments to help dancers perform better with less injury. For the loved one struggling with chronic pain: Taming Pain and Taming Stress – Cheryl Wardlaw is a physical therapist and teacher at Emory University Hospital in Atlanta, GA who’s specialty is treating patients with chronic pain. Cheryl used her knowledge gained over 35 years of practice to write these insightful books to assist patients in overcoming their pain. On a final note, these products mentioned about are all items that we have recommended to patients in the past but would like to mention that we receive no financial gains from the sales of these products. All items mentioned above are simply products that we have used and found to be beneficial in helping patients to achieve their goals. From all of us here at Prana, Merry Christmas and a Happy New Year. Lancaster currently ranks #9 in terms of healthiest counties in PA which is not bad but PA ranks #25 in the country. Lancaster has certainly experienced growth in many ways in recent years. The arts and culture communities have grown and become more diverse. The downtown area continues to expand in terms of business and restaurant diversity. More and more people are walking and commuting by bike. Across the country, communities that are active, are healthy. Here at Prana, one of our goals as a business located in the city, is to help Lancaster to become healthier. Beginning in October, Prana will offer a monthly 1 hour class to promote healthy running. To help show that Lancaster is becoming a more active community, we are going to help to encourage greater participation in the Red Rose Run through the completion of the course. Many Lancasterians participate in local 5K’s throughout the year such as the Race Against Racism. The Trick or Trot is another great local 5K which is held here in the city. This year may be your year to go the extra mile (or two) and attempt to complete the Red Rose Run (5 miles). For years, the Red Rose Run has been a symbol of running in Lancaster yet the number of participants is lacking. This year, we would like to do what we can to help the number of participants to exceed 2,000. One way to get on the right track is to attend our level one running class. 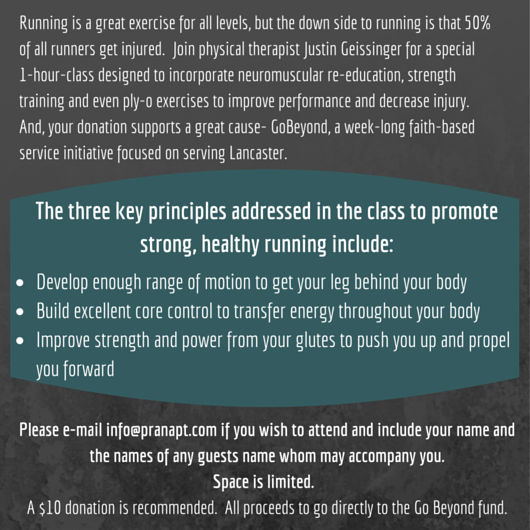 Our class will provide you with knowledge and expert analysis of how to perform a varying array of core and full body exercises to improve running performance and injury prevention. As with any Prana event, our class can give you the tools to improve not only your biomechanical advantage but also educate you on how posture can affect performance. Cost: $10 per person to benefit GoBeyond, a faith-based initiative to encourage, organize and mobilize people to better our community through acts of service. Last night, while talking with my wife, she began to reminisce about her younger years. My lovely wife is currently a stay at home mom and cares for our 3 young children. 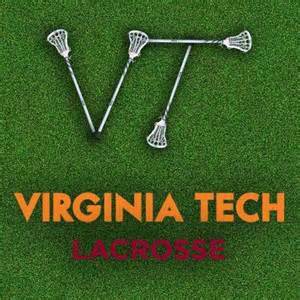 Back in high school, she was a dominant lacrosse player which later led to a scholarship to play Division 1 level lacrosse in college at Virginia Tech. Last night she pointed out how our kids will never know her as some amazing athlete but rather a responsible, caring and loving mom who is currently more apt to change a diaper and prepare a dinner than read a defense and score goals. Lacrosse is no where on the spectrum of current day to day activities. My wife is not alone in this situation. I talk with many people on a daily basis who reflect back on their “glory days”, when they identified themselves as athletes rather than dads, accountants, customer service reps, etc. My question now is, why does our society have to consist of work and athletics as a dichotomous relationship rather than a symbiotic relationship where physical activity and work performance enhance one another? 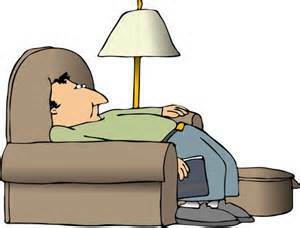 In our current system, our society as a whole exercises the 3 C’s (car, chair, couch) far too much, resulting in a system where people are often sick and unproductive. What is the big deal about America’s level of inactivity you may ask. In addition to putting a significant strain on our current healthcare system, it is also financially straining in the workplace. A 2013 Forbes article lists the annual costs related to lost productivity in the workplace at $84 billion. Finland is frequently listed in the top 5 most physically active countries in the world. saves Finland $6 billion dollars annually in health care costs. So what will it take for the United States to make a change in our collective health? Where do we begin? Why not start with Physical Therapists? After 7 years of education and earning a doctorate degree, we are to be the musculoskeletal experts. Many people know a thing or two about exercise and health just like they may know a thing or two about savings and investing. Since many people will hire financial professionals to help with budgeting and investing, why not consider hiring a physical therapist to assist in developing a plan for your overall health. A plan may include everything from a full body evaluation to locate muscle and joint flaws, manual techniques to restore muscle tone and range of motion and a home exercise program to provide strength in weak muscles. Just like with my finances, a random budget yields random results. A specific health evaluation and exercise program can help you to reach specific goals to prevent or eliminate specific flaws. What do you think about when you think of modern medicine? Based on how medicine is promoted in our culture, I think medicine almost always involves medications possibly some sort of surgery, multiple medications and definitely questions about insurance. For many, but not all, exercise does not receive a brief notion of existence in the field of medicine. Perhaps it should. One of the main reasons for bringing forth this idea is because the current system does not appear to be working and one of the major things missing in many peoples lives is physical activity. 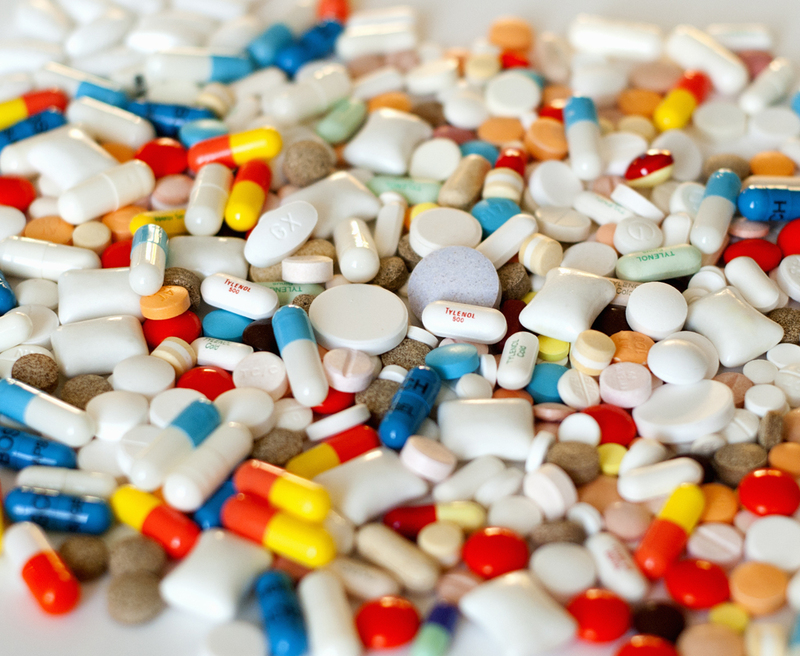 A few years ago, Time magazine published an article citing that the number of Americans taking anti-depressants to treat depression rose 400% from 1988 to 2008. That number would likely be higher had the Philadelphia Phillies won the World Series in 2008. Something more astounding than the large number of Americans who are depressed is The Atlantic’s article that exercise is the best medicine to treat depression. Many facts are exposed in this article but one that I found most outstanding was that one study showed 30 min of aerobic activity showed to be as effective as Zoloft (a common anti-depressant medication) in the treatment of depression. Not only did the aerobic activity prove to be effective, it also further limited relapses in symptoms in comparison to medications. One may not consider this to be very impactful news until you consider that anti-depressant medications make up one-third of all prescription drugs in America. Imagine the economic impact of replacing one-third of our prescription drug market with aerobic activity. This is pure speculation but imagine the impact aerobic exercise could have on recreational drugs. Many people resort to drug use due to depression. Imagine the new public service announcements: “don’t do drugs, Walk”! Why is it that physicians are so quick to prescribe a medication rather than an exercise plan? One can speculate various reasons why but some of the facts include lack of knowledge of exercise and lack of time to develop a plan. Many physicians today work under extremely stressful conditions w/heavy patient case loads and minimal time. Physicians are also heavily educated about medications while only being minimally educated about exercise. 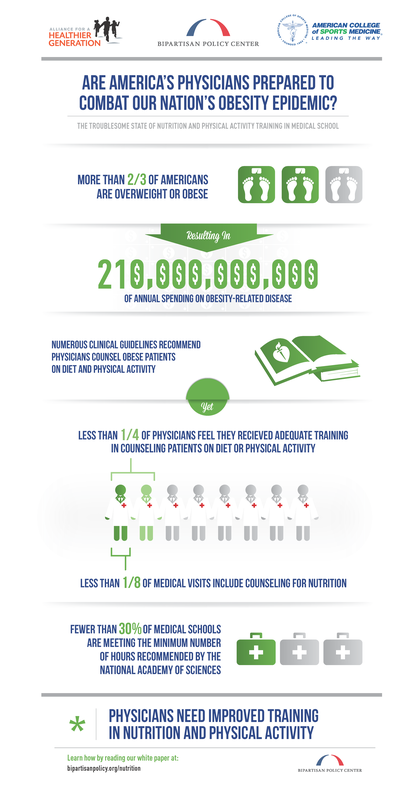 A 2014 article from the Washington Post cites polls that show less than 25% of physicians feel they have sufficient training to offer diet and physical activity advice. Physical education in medical school currently averages 19.6 hours nationally. The National Academy of Sciences recommends at least 25-30 hours throughout medical school. There are some industry experts when it comes to exercise. Experts include some doctors such as Dr. Jordan Metzl M.D. of New York City who recently wrote a book titled the Exercise Cure. Another group of experts include physical therapists who’s 7 year education includes not only all sciences and anatomy but also various courses on human kinetics and physiology. Currently, nearly all Physical Therapy schools in American provide doctorate level education which requires all physical therapists to be experts in treating patient’s musculoskeletal issues. Physical therapists can also be considered experts in performing a physical screen of someone interested in beginning an exercise routine but are fearful of potential injuries. The bottom line is that our current medical system is broken and in need of therapy to return to full health. Expect more posts on the topic of health care in the near future. For now, consider consulting a physical therapist for any musculoskeletal ache or weakness that you may be experiencing. Don’t be so quick to discredit physical therapy as a valuable contributor to the medical system. One common complaint that we hear from multiple patients is pain coming from the hip, back, and various other body parts while driving. 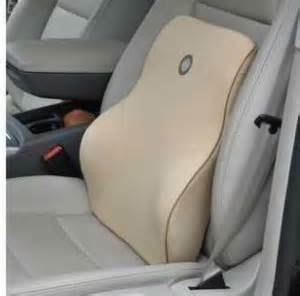 This summer, before getting in the car for several hours to drive to your vacation spot, you may want to consider adjusting your seat to prevent pain. First, let’s consider the car seat: It looks so comfortable and inviting to take you on a wondrous journey of adventure, nostalgia and fun. In reality, this vehicle of fun may also be a version of a torture chamber that quietly inflicts more pain the more time you spend in it. 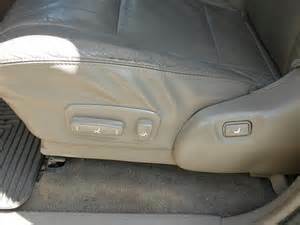 How can it be that something so practical as a car seat could cause so much pain. Now lets discuss briefly the lumbar spine. The American Academy of Orthopedic surgeons estimates that between 60-80% of adults will experience low back pain at some point in their life. 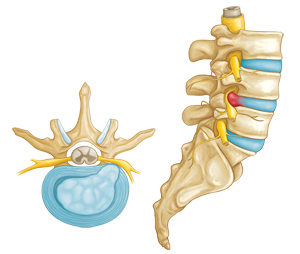 Below is a picture of the anatomy of your lumbar spine with a possible disc herniation. Notice the area in red that is compressing the nerve (in yellow) as it exits the lumbar spine. This area of compression is often exacerbated with prolonged sitting, particularly slumped or slouched sitting. Sitting can allow for your body weight to place more compression on the front your lumbar disc which can then lead to more pressure of the disc on the nerve. If you maintain the seated position for several hours, pain can begin to intensify. The typical pattern of pain begins with isolated pain in the low back or hip but then radiates further below the hip into the leg. Over the years, we have heard of patients doing some very obscure things to achieve comfort while driving. Some people simply lay down in the back seat, others turn their heated seats to full blast and still others take pain killers in an attempt to reduce the pain. One thing people forget to do is simply adjust their sitting posture properly to off-load the weight on their lumbar spine. Lumbar spine supports such as the one pictured below can offer some relief but more important is the support of the sacrum. With lumbar supports, it is still possible to slump sit and therefore have pressure on a lumbar disc. An alternative is sacral support which helps to maintain stability at the pelvis. Imagine the pelvis is the foundation of your spine. If you sit with your pelvis slumped into your seat, as pictured below, every spinal segment above the pelvis will also have poor positioning. For a different approach, if you support your pelvis, with a rolled up towel for example, your back can maintain a more neutral alignment and therefore off-load some of the pressure from your lumbar spine. 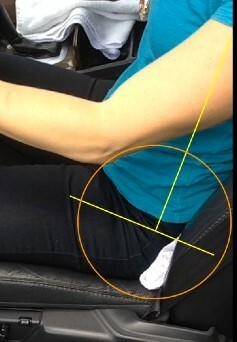 Notice the position of the pelvis in the picture below; see how it is near perpendicular to the seat surface? There is no slumped sitting and therefore reduced tension on low back! While simply adjusting your seated position may not cure all pain, it is something to consider while attempting to “take the edge off”. However, in some situations, remember that seeking medical intervention from your physical therapist or primary care physician may also be necessary to further assist in eliminating pain. Can Physical Therapy Save You Money? As a physical therapist, of course I am biased to answer that question with a resounding YES! The Washington Post recently published an article commenting on a research study about the costs associated with low back pain. The article titled “Oh, my aching wallet: MRI instead of physical therapy for low back pain leads to $4,793 higher price” explores the cost of an MRI versus going straight to Physical Therapy for treatment. For many, just the words “herniated disc” strikes fear/terror in thousands if not millions of American adults. What is it about the term “herniated disc” that is so closely associated with agonizing pain. Granted, many have experienced excruciating pain due to some degree of lumbar disc injury. In reality, about 40-60% of all disc herniations are asymptomatic. In short, this means that about half of all people with herniated discs never knew that had a herniated disc. Along those same lines, the Washington Post article points out that most people over 40-50 years old have some level of benign back impairment that can be perceived as a more serious condition. One of the several downfalls with MRI’s is that they can show varying levels of medical conditions that exist in your body that your body doesn’t recognize as problematic. The Advanced Physical Therapy Education Institute refers to this as VOMIT (victims of medical imaging technology). Basically, this study shows that while imaging (in forms of MRI or x-ray) may detect various levels of injuries throughout the body, most people never feel the pain until after made aware of an injury with the image. In the state of Pennsylvania, physical therapists are not able to order such diagnostic tests as MRI’s and X-rays, we only assess with our eyes and our hands. With every new evaluation we see, we constantly assess how muscles and joints are moving. If we detect a muscle or joint is not moving correctly, we prescribe an exercise or apply a mobilization in an effort to help a joint move appropriately. Beyond movement, physical therapists are assessing posture. We want to see how a patient is holding themselves throughout the day. How do they sit, how do that stand, is there something about a patient’s sleeping position that is affecting their pain. If you do not believe that posture can affect pain symptoms, simply try keeping a pain journal. Do you see any patterns? Do you have pain after driving to work, when waking in the morning, after sitting to several hours in a board meeting or lounging on a couch watching a movie. If so, you may benefit from a visit to your physical therapist. African running dominance. American eating dominance. The 119th running of the Boston Marathon was held this past Monday. Seven of the top ten men’s finishers were from Kenya or Ethiopia. The exact same is true for the women, seven of the top ten were from Kenya or Ethiopia. Last year, Meb Keflezighi became the first American male to win the Boston Marathon in 31 years. This year’s Boston Marathon was another example of the African nation’s continued dominance of the marathon. While Americans continue to train harder, and strive to improve in long distance athletics, there is one activity that Americans truly dominate and that is eating. As a whole, America consumes more calories per capita per day than any other nation in the world. With as much as America eats, we only rank 39th (out of 47 qualifying nations) in terms of fastest finishing marathon times among amateur runners. While many Americans may dream of being able to run like Africans, millions more Africans dream of being able to eat like Americans. The Global Aid Network (GAiN) is a non-profit organization based right here in Lancaster, PA that “serves the toughest places on earth by relieving suffering and restoring dignity.” One of their focuses is to feed those who are hungry in third world nations as well as other distressed areas through their meal packing program. The United Nations reports that 6.5 million children under 5 years old die every year due to starvation. In 2012, GAiN was able to pack and deliver over 13 million meals to needy families through their food program. On May 13th and 14th, as part of the Lancaster Go Beyond initiative, hundreds of volunteers will be working at Clipper Magazine Stadium to pack meals for GAiN. For every 25 cents raised, 1 meal will be packed. If you are interested in participating, here are a few ways you can get involved. 2. Register for the EmPower 5K on May 30th. All proceeds from this even will also go toward the Go Beyond campaign. 3. Donate time or money through the Go Beyond website.